Edward MacMillan Taylor was born in Glasgow on 18 April 1937. He was educated at Glasgow High School and University, where he joined the Conservative Party. He became a Councillor at 22 and in 1964 he was elected for Glasgow Cathcart in a by-election. He married Sheila Duncan in 1970. He served as Minister for Health and Education in the Scottish Office during Edward Heath’s government, but resigned shortly afterwards in opposition to Heath’s decision to join the ECC. A member of Margaret Thatcher’s shadow cabinet in opposition, he lost his seat when the Conservatives returned to government in 1979, although he won the Southend East by-election in 1980 and held the seat until he retired in 2005. He was one of the ‘Maastricht Rebels’ who voted against John Major’s bill to implement the Maastricht agreement in 1992, and lost the party whip, continuing to sit as an independent. 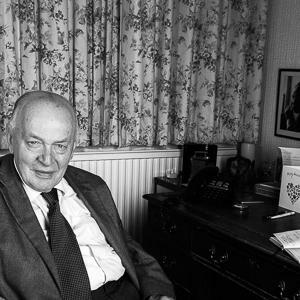 Sir Teddy Taylor died on 20 September 2017, and his interview has been featured on our blog. Click here to listen to the full interview with Sir Teddy Taylor in the British Library. I went in to the tea room, and the only people I knew were actually Labour MPs from Glasgow, they were very nice people so I went to have a cup of tea with them. It was very funny, I was just sitting down there, having a chat with them, and then there was a very nice man called Harold Wilson you might remember him, who came and said ‘Who are you?’ and so I said: ‘I’m Teddy Taylor’ and he said ‘You are a conservative?’ I said ‘Yes’ ‘What are you doing in this table?’ and I said ‘Well, these are my friends’ and he said ‘Oh, that is one thing that you’ll have to learn, we have segregation here’. He was very nice and just told me that something I should know for the future that we all sit in different places so we don’t listen to other people’s conversations. […] I found this when we went for lunch…I said ‘I don’t know where I’m going to sit’ and they said ‘The division here: that side is all the Labour side, that side is the Conservative side and one small, narrow table in the middle of the circle for the Liberal Democrats’. […] It worked perfectly like all these Parliament things do until something went wrong. Not then, but at an election a wee bit ahead there was a man elected to Parliament, for the first time as a Welsh Nationalist, called Gwynfor Evans. A very nice man, I got to speak to him and become very friendly. He was the first Welsh Nationalist, so he come in to get his lunch and he says ‘Where can I sit?’ and they say ‘ I’m afraid there is nowhere for you to sit, you would have to go to the other place to eat downstairs’. Which he did. He went to the dungeon downstairs, but they don’t have the tablecloths and waitresses, they just have a blackboard that never changes…He never complained, he went there for six months and enjoyed his lunches there, no trouble at all, but then we had a lady elected, you probably know, called Winnie Ewing who was elected as the Scottish Nationalist. Oh dear, dear, she caused all kind of trouble saying that it was upsetting, unfortunately for a woman and the Scots were feeling ashamed that they were not given a proper seat and something should be done about it. So they had a special meeting at the House of Commons Catering Committee and they said ‘Well we don‘t want to have a nationalist seat because that will just encourage more of them to come’. So eventually they decided to have what they call a Minority parties table. Track 1 [00:36:37] [18th January 2012]: Sir Teddy Taylor [TT] comments on growing up in Glasgow and Grammar schools. [2:40] Memories of TT’s father and home life. [4:11] Story about Glasgow antique shop. [5:06] Comments on wartime Britain and bombing. [07:46] Description of family home and lifestyle. [09:23] Memory of childhood holidays with Auntie. [10:55] Description of TT’s mother and collapse of his father’s business. [14:38] Comments on TT’s sister and growing up with cousins. [17:01] Remarks on school life and story about debating society. [19:24] Memories of school friendship group. [20:19] Story about having to wear a kilt to school. [20:52] Comments on other school activities and exams at university. [22:21] Description of change between school and university life. [23:31] Story about confronting communist lecturer and switch from history to politics and economics course. [26:22] Story of getting first newspaper job at Glasgow Herald and then at Clyde Shipyard Association. [28:50] Comments on relationship with shipyard Union bosses and negotiation process. [30:47] Remarks on relationship with shipyard employers. [32:31] Comments on Union representatives’ relationships with members and Union rules preventing competitiveness. Track 2 [1:00:42]: Joined Conservatives because of Grammar schools Comments on Conservatives and debating society at University [0:53] Description of Glasgow Parliamentary debating society, met in Christian Institute. [02:34] Story about being asked by Alec Hatton to be council candidate for the Progressive Party at 21. [04:50] Story about telling the University Conservatives of candidature. [05:50] Remarks on relationship with University Conservatives. [6:45] Description of local election campaign in Townhead. [9:00] Story of By-Election campaign in Cowlairs. [10:42] Remarks on standing for election. [11:13] Story about selection for parliamentary candidate and parliamentary campaign. [14:13] Remarks on family’s opinion of political involvement. [14:40] Description of political meetings at Townhead and Springburn. [15:50] Story of standing for council for Cathcart [16:36] Comments on work as a councillor and ward. [17:16] Comments on nastiness in Cathcart politics and restoring majority. [18:30] Description of employers and union colleagues’ reaction to TT’s election. [20:15] Story of selection for parliamentary seat and campaign in 1964. [22:13] Story of going to Parliament for the first time, problems of low salary and finding somewhere to live, and feelings on winning, arguments over strategy and campaign team, and excitement in the constituency. [24:58] Remarks on joining Thatcher’s shadow cabinet and devolution. [25:40] Remarks on losing the seat and political ‘crusade.’ [26:45] Comments on EEC, selling council houses and grammar schools. [29:00] Comments on beginning parliament, and working constituency surgery. [33:10] Remarks on relationship with local councils and handling casework. [36:17] Comments on relationship with local associations and constituency activity. [39:09] Stories about visiting MPs. [41:00] Comments on experiences of campaigning and press. [42:46] Comments on anti-devolution campaign’s impact on Cathcart seat. [43:45] Remarks on shadow cabinet. [46:20] Story about Margaret Thatcher phoning TT to commiserate loss of TT Cathcart seat in 1979. [47:14] Story of standing for Southend. [49:10] Remarks on reaction of constituency party and election. [50:30] Comments about family moving to Southend. [51:26] Comments on loosing Cathcart seat and Party class image [53:55] Comments on Margaret Thatcher’s popularity and policies. [56:08] Story about argument between TT and Margaret Thatcher over treaty. [56:49] Comments about time out of cabinet during 1980s. [57:00] Comments on resigning from Heath’s cabinet and on TT’s relationship with Ted Heath and John Major. [59:06] Remarks on Ted Heath’s election and policy on Common Market. Track 4 [00:47:44]: Comments on Common Market and Group of 8: its strength because the government had majority of 7, and they held the balance of power. [1:24] Explains system of whipping. [4:20] Comments on power of Parliament changing and European parliament. [05:26] Remarks on backbench tactics, and parliament’s relationship with Europe. [09:18] Comments on MEP’s and democracy. [09:59] Discussion about groupings of MPs and anti-market organisations outside Parliament. [13:48] Comments on Lisbon treaty and EU. [15:31] Remarks about social life as an MP. [17:12] Feelings about having left parliament. [17:59] Comments on how being an MP affects family life. [20:06] Comments on alcohol and politics. [24:08] Remarks on MPs’ workloads, meetings and office support. [25:31] Comments on MPs drinking. [26:30] Comments on boredom in parliament and filibustering. [28:49] Description of relationship with political opposition. [30:27] Relationship with others in Conservative party. [32:00] Story of deciding how the Group of 8 would vote. [33:08] Story of how the Group of 8 came together in January 1995. [36:21] Comments on friendship in Parliament. [37:25] Comparison of reality with expectations of Parliamentary life. [38:00] Remarks on using Parliamentary questions and written answers. [38:25] Comments on parliamentarians TT admired, particularly Harold Wilson and Gordon Brown. [40:50] Story about Enoch Powell and graveyard. [43:00] Comments on Keith Joseph. [44:35] Feelings on retiring from Parliament and living in Southend. [45:50] Comments on strong beliefs on EU and Middle East.